I need to be elsewhere this evening, so there’s a need for one dinner that can be served at two different times without deteriorating overly. I’m combining the leftover corned beef from the weekend with the leftover rice from last night, adding a mix of fresh and frozen vegetables and making my Almost Genuine Fried Rice. The problem is that – given how simple the dish appears – the instructions are surprisingly complex. Oh well. 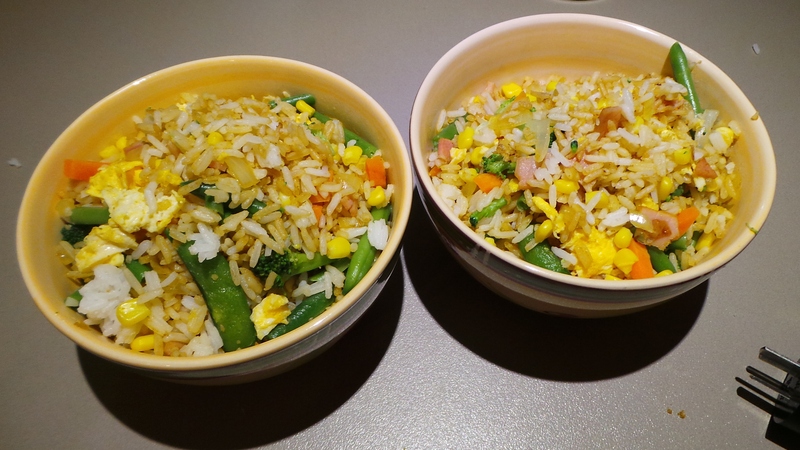 Anyway, the rice that isn’t eaten tonight will help to form lunches in the days to come or possibly even another dinner on a “shop the fridge” night. I’m planning on making a casserole tomorrow night with some sausages that have been in my freezer for a while. So they have been taken out to defrost. I’ve realised that I was about to run out of onions and carrots (Argh!) therefore I’ve stocked up on those today. Remember the $5 I had left at the end of my shopping, here? Well, I just used $2 of it. So there.